I’d agree with this but only to a point and mostly for corporate clients. For personal users, it really depends on what they want to get out of socialmedia. Some use it for voicing complaints, others to share their lives with the world, for the most part, my guess is that it would be a mixture of the above. Andrew – (G – hope its okay that I respond to this) The simple answer to your follow-up question is yes. 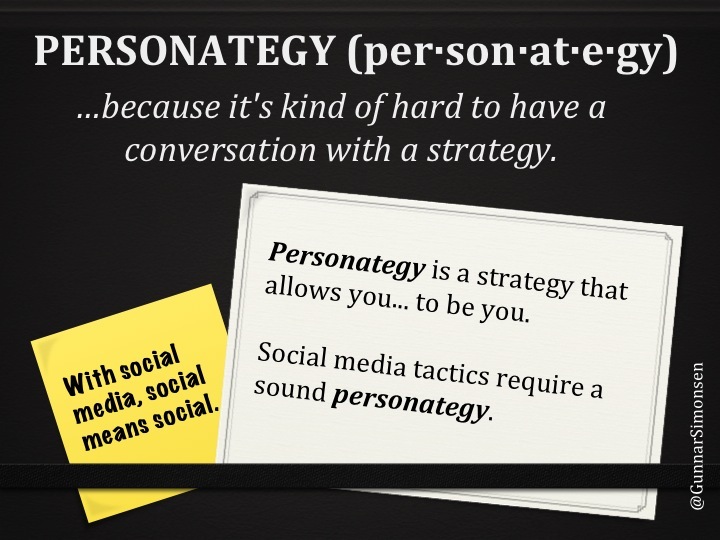 Long answer: I think everyone, corporate & individual, should employ a personategy when it comes to social media. You need to think before you post! You are creating an online reputation. Do you really want to be the person whom everyone ignores because all you post is what you’re eating or where you are? Not to say you don’t ever post those things, but at some point you’re going to want to use social media to do social good – you need to make sure that you’re being heard. Personategy & strategistics is this – make a plan and then work the plan. Besides, then you don’t have to think twice about what to post & when. Great for those of us who occasionally suffer from the paralysis of analysis.